Finished? Now complete (in your head or on a piece of paper) the task that follows from this link: Fun Activity! The fact that you tended to see the aggressive words, however, was a result of priming. Priming can be defined as when a particular stimulus brings to mind certain associations or representations in your memory. So with today’s example, by seeing all of the weapon imagery, it made thoughts related to aggression and violence more accessible, or in other words, easier to think of. Therefore when you have ambiguous stimuli such as those fill in the blanks, answers related to violence come more easily to mind than other suitable answers. Well actually, yes, it is a whoop of the larger variety. For example, let’s say you’ve been “primed” for violence after seeing a new action movie at the theater. Then afterward, when you’re driving home, someone cuts you off. Now, you could interpret their behavior as accidental, but considering thoughts of aggression are more easily accessible (due to the movie), you may interpret their behavior as intentionally aggressive. And at this point, you would be more likely to honk your horn, flash a lone finger, or engage in other behavior that may lead to progressive aggression. 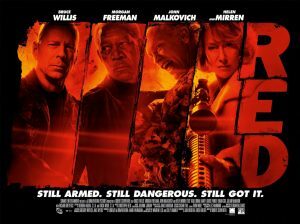 A movie that combines violence with the elderly. All right, so you buy that aggressive images can make your thoughts temporarily more aggressive. Heck, you may even agree that it might influence your behavior a tad. But what happens if you primed something more subtle? Something less arousing? Something, say, like the elderly? Switching topics, this following study aimed to prime participants with the concept of elderly. That is, researchers gave participants a “sentence scramble” task where one gets a list of words (e.g. “us play sing bingo let”) and is told to use all but one of the words to form a comprehensible sentence (i.e. let us play bingo). 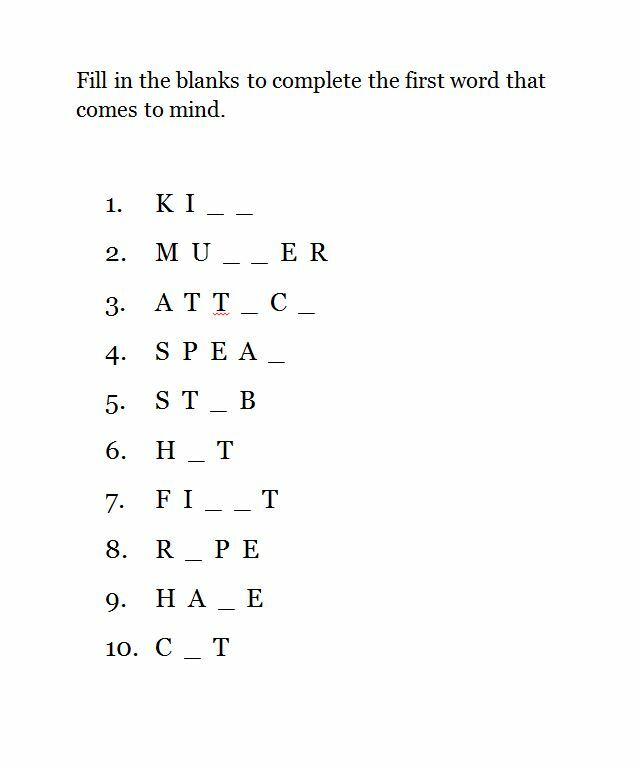 Now, half of the participants solved ten of these sentence scrambles with nonthematic words, while the other half solved them with words related to the elderly (e.g. “bingo,” “wrinkle,” “Flordia,” etc.). After solving these sentences, participants were excused from the experiment, where they were secretly timed by an experimenter on how long it took them to walk down the hall. Amazingly, those who had solved the sentence scrambles with words hinting at elderly walked significantly slower than those who had solved the other sentence scrambles. And no, not a single participant recognized any theme to the sentences! Thus, having elderly subconsciously activated in their thoughts, resulted in an actual effect on behavior. Which makes you wonder: What other influences in your environment are affecting you without your knowledge? Or better yet: How can you use them to your advantage on other people? We’ll talk more about some of the cool effects in priming and how it works next week. Good stuff. Priming is a very valuable skill to learn. I do a lot of self-priming to motivate myself to do things when I’m having trouble executing on one of my plans or goals. But in a larger context, its important to create an environment for yourself that primes you for success. I’ve put in a lot of thought into my apartment so it keeps in my mind the things I want. Some people look for the negative and some people look for the positive. When I visited you in Portland you had sooooooooooo many books in your library. It may prime you for writerly thoughts or inch you closer towards completing a book when you see that so many other people have done it. It may give you confidence that you can do it, too. Always with an insightful comment, I love reading your feedback! Priming is a very valuable tool in research and out (one you seem to have capitalized on subconsciously or otherwise). In research, it allows us to put people in a mindset without them being aware to it. In the real world, it allows us to direct people toward certain thoughts that can help motivate attainment of goals. I’m glad to hear you’re using psychology to your benefit! And I do have a lot of books, like you said, to remind me that I myself can write a novel if I put in the effort. Plus, who doesn’t want to have a mini-library in their house?